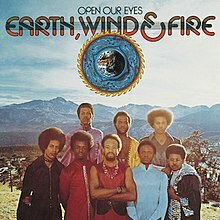 Open Our Eyes is the fifth studio album by Earth, Wind & Fire, released on March 25, 1974 on Columbia Records. The album rose to Nos. 1 & 15 on the Billboard Top Soul Albums and Top Pop Albums charts respectively. Open Our Eyes has been certified Platinum in the US by the RIAA. Open Our Eyes was produced by Maurice White and Joe Wissert. Charles Stepney worked on the album as an associate producer. In 2001, Open Our Eyes was reissued with four bonus tracks. Rolling Stone calls Open Our Eyes a "cheerful" LP with lots of "positive elements". The Village Voice's Robert Christgau also describes the album as a complete "tour de force". The track, "Mighty Mighty", peaked at Nos. 4 and 29 on the Billboard Hot Soul Songs and Hot 100 charts, respectively. "Kalimba Story" reached No. 6 on the Billboard Hot Soul Songs chart. Another single, "Devotion", peaked at Nos. 23 and 33 on the Hot Soul Songs and Hot 100 charts, respectively. Credits are adapted from Allmusic and the album's liner notes. ^ a b "Earth, Wind & Fire: Open Our Eyes". 45worlds.com. ^ a b c d Henderson, A. "Earth, Wind & Fire: Open Our Eyes". allmusic.com. ^ Earth, Wind & Fire: Open Our Eyes. Billboard Magazine. March 16, 1974. p. 48. ^ Warner, S. (2011). "Earth, Wind & Fire: Open Our Eyes / Spirit < PopMatters". popmatters.com. Retrieved 22 July 2011. ^ a b Emerson, Ken (May 9, 1974). "Earth, Wind & Fire: Open Our Eyes". rollingstone.com. ^ "Earth, Wind & Fire". warr.org. 2008. Retrieved 22 July 2011. ^ a b "Earth, Wind & Fire: Open Our Eyes". robertchristgau.com. ^ "Earth, Wind & Fire: Mighty Mighty". 45cat.com. ^ "Earth, Wind & Fire: Kalimba Story". 45cat.com. ^ "Earth, Wind & Fire: Devotion (Hot 100)". billboard.com. ^ "Earth, Wind & Fire: Devotion (Hot R&B Songs)". Billboard.com. ^ a b Earth, Wind & Fire. “Open Our Eyes” (Album Notes). Columbia. 1974. ^ a b Earth, Wind & Fire. “Open Our Eyes” (Remastered). Legacy’s Rhythm Soul Series. Columbia / Legacy. 2001.